Gallery Miscellaneous Are You Gay? 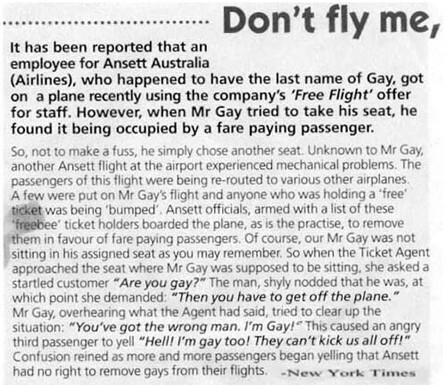 It has been reported that an employee for Ansett Australia (Airlines), who happened to have the last name of Gay, got on a plane recently using the company's 'Free Flight' offer for staff. However, when Mr Gay tried to take his seat, he found it being occupied by a fare paying passenger. So, not to make a fuss, he simply chose another seat. Unknown to Mr Gay, another Ansett flight at the airport experienced mechanical problems. The passengers of this flight were being re-routed to various other airplanes. A few were put on Mr Gay's flight and anyone who was holding a 'free' ticket was being 'bumped'. Ansett officials, armed with a list of these 'freebee' ticket holders boarded the plane, as is the practise, to remove them in favour of fare paying passengers. Of course, our Mr Gay was not sitting in his assigned seat as you may remember. So when the Ticket Agent approached the seat where Mr Gay was supposed to be sitting, she asked a startled customer "Are you gay?" The man, shyly nodded that he was, at which point she demanded: "Then you have to get off the plane." Mr gay, overhearing what the Agent had said, tried to clear up the situation: "You've got the wrong man. I'm Gay!" This caused an angry third passenger to yell "Hell! I'm gay too! They can't kick us all off!" Confusion reined as more and more passengers began yelling that Ansett had no right to remove gays from their flights.